I just realized I haven't posted since September. Time has whirled by since school started! We had such a beautiful Seattle summer, but last weekend it started raining again. I mean a lot of rain. Buckets. During our torrential downpour, I decided to put my craft on. Time to give some life to this plain blue t-shirt. 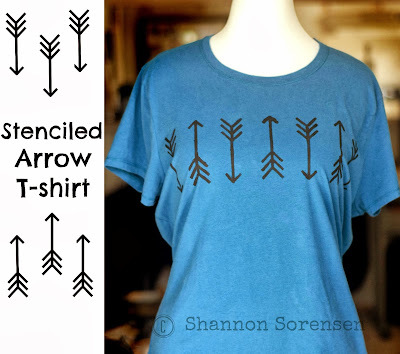 I love all the arrow designs I'm seeing lately, so I decided to create my own. PRINT: Find a clip art image online. Print it on paper or heavy card stock. 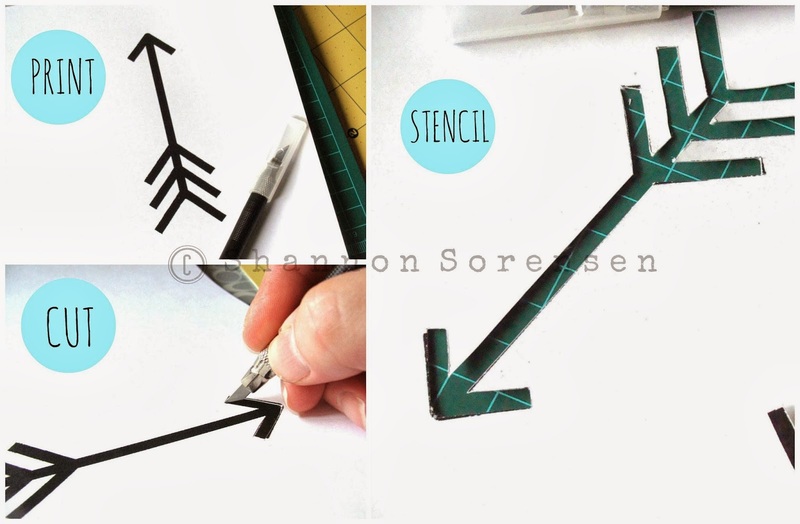 CUT: Cut out the shape of your stencil with a cutting tool. STENCIL: Use your heavy cardstock stencil or trace your stencil on heavier material and re-cut. 1. PROTECT YOUR FABRIC: I ironed a piece of freezer paper to the inside of my t-shirt so the paint wouldn't go through. You can also use a piece of cardboard. 2. FABRIC PAINT: I like SoSoft fabric paint because it leaves a flexible, soft finish. Put a piece of saran wrap on a plate or surface for easy use and clean up. 3. 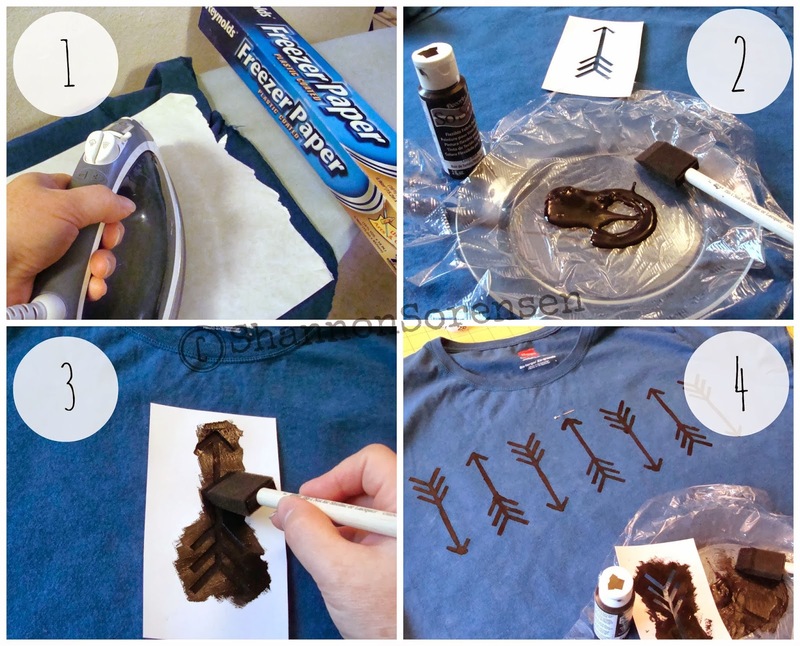 APPLY PAINT: Hold down stencil and use a foam brush or other applicator and gently blot paint through the stencil on the shirt. Move stencil as needed and repeat. 4. FINISHED DESIGN: Let your painted design dry. SoSoft Paint doesn't require ironing to set the color, but once dried, you can heat set paint with a dry hot iron (using a cover cloth) for 2-3 minutes. I love the way it turned out! It's fun by itself and a pair of jeans, with a black long-sleeve t-shirt under it, or paired with a jacket or cardigan. The wheels are still turning as I try to come up with a design for my other plain t-shirt...and speaking of turning wheels, it's time to go for a bike ride. It's been a week or so since I've been able to go because of the rain, but we're getting a break today! my favorite time to sew and craft is in the rain and snow. 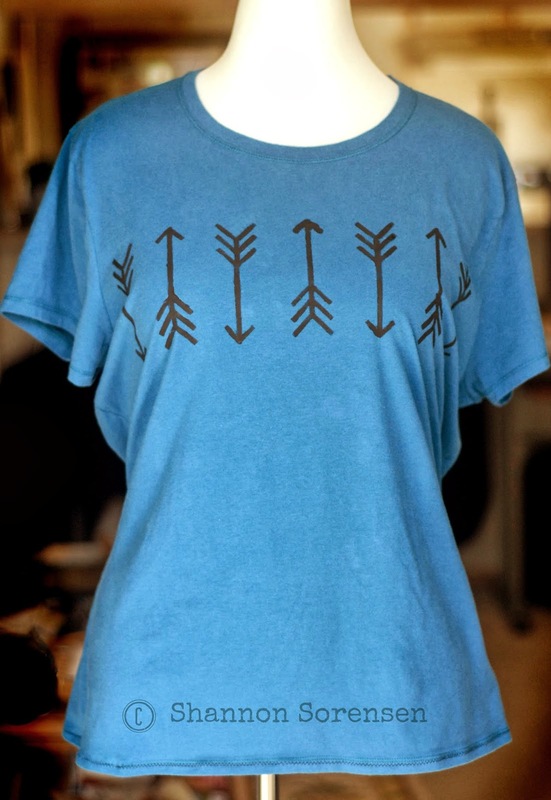 i love these little arrows!! 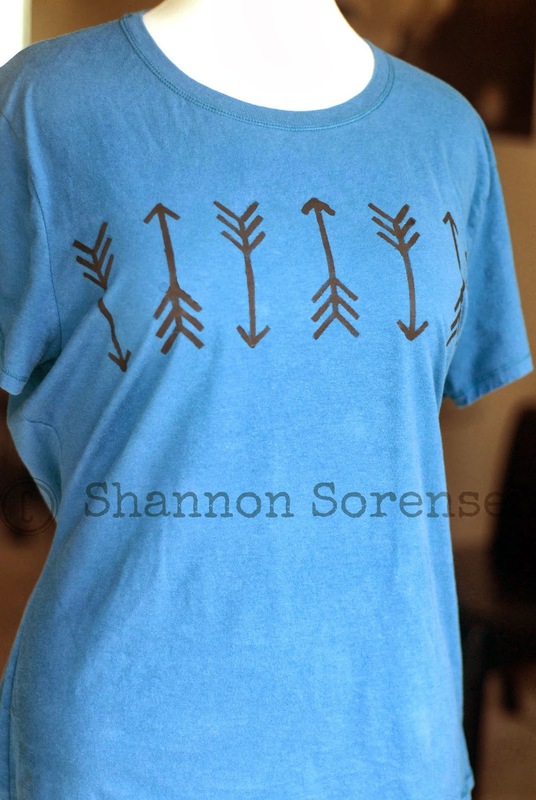 great idea to make your own stencil for onesies or little kid shirts. Thanks Emily! It's fun crafting when it's cozy! Cute cute! Love this! Thanks so much for stopping by chapter37! i can't wait to make some of these on onesies! Great idea to stencil arrows on a onesie! Hi Karla - thanks so much for stopping by and for the invite! 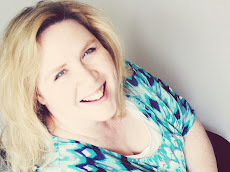 Thanks for linking to Take-A-Look Tuesday over at Sugar Bee Crafts - you were featured this week! wow, i can't see it's you handmade if you only show me the tshirt. it's fabulous and very creative. Thanks so much! It's still one of my favorite t-shirts! Love it. I'm gonna try and make it this week.